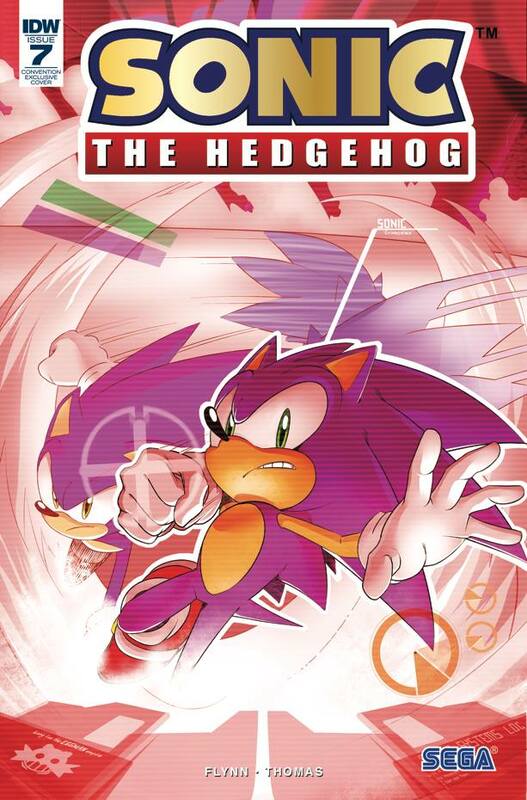 San Diego Comic Con has come and gone and there is plenty of IDW Sonic news to discuss! The convention was rife with exciting and unexpected news that will be sure to have fans hyped for the coming months and beyond! On Thurdsay, at 2:00PM, IDW held the Sonic the Hedgehog Way Past Cool Panel featuring: Editors Joe Hughes & David Mariotte, fan favorite artist, Evan Stanley, SEGA Licensing Specialist, Joe Cisneros, Director of Product Development, Austin Keys, and the Head of Sonic Team, Takashi Iizuka! There was a lot revealed so, I will break it down in bullet points! Convention Exclusive variants for issue #7 revealed (See below for more information). A & B Covers revealed for Issue #8 by Evan Stanley. Whisper the Wolf designed by Evan Stanley revealed. The next arc will be “The Battle for Angel Island”. Team Sonic Racing One-Shot written by Caleb Goellner and illustrated by Adam Bryce Thomas. Big the Cat will be a playable character in Team Sonic Racing. Later that afternoon, the IDW booth was manned by Caleb Goellner, writer of the newly announced Sonic Team Racing One-Shot, fan favorite artist, Evan Stanley, and Takashi Iizuka, himself! Fans could not only meet these creators, but pick up an exclusive cover of Sonic the Hedgehog #7. Lucky fans could pick up 1 of only 500 Jamal Pepper’s foil variants for $10.00. Likewise, those who missed out on the initial release of the Box Set had a chance to pick up 1 of the 300 available for $25.00! Likewise, available exclusively at the Diamond booth across the way was the secret Adam Bryce Thomas foil variant. A much more generous 2,000 copies of this were produced. Yet another unannounced foil variant of Nathalie Fourdraine’s #7 RI cover was available exclusively to attendees of the Diamond Retailer Appreciation Lunch. There is a lot to look forward to in the coming months! New arcs, new characters, new worlds to explore, and Big the Cat! While many of the announcements might not have been all that surprising for avid Sonic fans, they are nonetheless exciting!